Backpacks can be tricky when you need one for traveling adventures. After all, how hard can it be to purchase the best travel backpack? The truth is that going with the cheapest unit you'll find in a random shop can take your experience to a certain point. However, with time, you'll understand the reason behind a popular saying – you get what you pay for. Whether the zipper fails on you in the middle of an adventure or you touch a sharp thing and the material tears apart, chances are you'll have to replace your cheap backpack every couple of months. It adds up overtime, hence the necessity of buying a quality, well built unit from your first attempt. There are more things to look for when shopping for the best travel backpack. Most people are not aware, but backpacks come in more types. For instance, you can find daypacks, as well as internal frame packs or external frame packs. Daypacks are basic, while internal frame packs go for heavier loads – usually over 15 pounds. They're excellent for climbing or hiking. External frame backpacks can take heavy loads too, yet they're mostly recommended for walking on trails. The difference is easy to spot – external frame backpacks have a higher center of gravity, which adds to your posture. Once you have the fit checked, go for capacity. Obviously, you don't want to stick your foot into your backpack in order to zip it up, so get the right size. In terms of features, think about your needs. Don't spend money on bells and whistles that you'll barely use once, but on features that will actually boost your travel experience. In the end, a little research will work wonders on your venture. So, what are the best rated travel backpacks on the market today? This model from AMBOR can easily become the best travel backpack out there. Although initially designed for students, anyone can benefit from it. It's available in a gray/black combination, so it also looks sleek. It measures 19.7x11.6x7.5 inches and has a dedicated laptop compartment. It can take laptops up to 15.6 inches in size. It's one of the first backpacks to have a dedicated compartment. While most units can take laptops, they'll slip around and move, causing damage. The unit is made of nylon fabric and has two curved shoulder straps. The material is environmentally friendly and lightweight. It has an anti-theft feature in the lock, as well as the metal zippers. They are durable and solid. As if all these were not enough, the backpack has a built-in USB 2.0 charging port. The cable is included in the package. You can use it to connect the power bank, as well as your smartphone. Plus, how about listening to your favorite music while walking? Other than that, the package comes with a combination lock too. What's to like about this backpack? This model from AmazonBasics can easily turn into the best travel backpack out there. It doesn't have any bells and whistles, no tech features and no drama – just the basics taken to the right level. After all, you want a travel backpack and not a portable desk. It measures 15 x 6.5 x 20.1 inches. It's made of durable polyester, so it's not too heavy – just over 3.5 pounds. The padded shoulder straps make it comfortable, but they're also removable for convenience. The waist belt and sternum strap can also be removed. They become mandatory on travel adventures though. In terms of organization, you have everything you can ask for. The laptop sleeve can take any type of laptop, regardless of its size. The main compartment comes with a zippered mesh space, a midway shelf that can be removed and internal compression straps for efficient packing. There are front pockets for documents and liquids, as well as a key clip. The storage space is highly customizable and expandable, depending on what you carry. If you don't have a laptop, the laptop sleeve is not wasted space because it can expand and take thicker things too. This model is YOUSU's best travel backpack. It's a multipurpose backpack that can boost your traveling adventure. It can be used in three different ways. Although designed as a backpack, it's also usable as a duffel or a hand carry on. When used in other ways, the backpack strap can be tucked in. In other words, it makes an excellent choice for both outdoor adventure and flights. As for its zippers, they are sturdy, so they won't quit of you when you overload the backpack. The unit is made of canvas. It can't repel water under heavy rain. It's quite lightweight though – just 2.7 pounds. With all these, it's large – 11x10.2x18.5 inches, so it has a decent internal capacity. You have not less than 7 pockets. 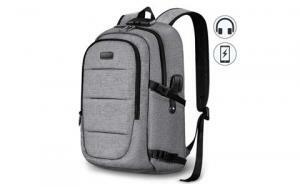 Apart from the main compartment, the backpack comes with a laptop sleeve and two pockets on the inside. The laptop compartment can't take big laptops though – not bigger than 15.6 inches. One of the best parts about this backpack is the fact that you can wash it in a regular washing machine, yet you should use cold water. If you don't have this setting, wash it manually. Hang to dry and never put it in a dryer. Yousu's backpack is ideal for students who need a proper organization. With so many compartments, it allows you to find things immediately. When overfilled, this backpack will feel a bit heavy. It's not so good in taking sharp and metallic items due to the canvas construction. This model from MATEIN draws some attention with its stylish appearance. It's the kind of backpack you use to look good, but also to keep yourself organized. It's available in a gray/black color combination and made of polyester. It's water resistant, but it doesn't mean you can take it underwater. The durable fabric keeps rain away, which is excellent if you use it to carry your laptop. Its zippers are metallic, so they won't give up on you in the middle of nowhere. Given the construction, this unit is ideal for everyday travel purposes. Also, the airflow back technology ensures your back doesn't get too sweaty over long walking trips. In terms of storage, there's a laptop compartment to accommodate 15.6 laptops, as well as a spacious main compartment to take all the daily needs. The front one has multiple pockets, as well as a key hook. An outside USB charger allows charging your smartphone as you walk or play your favorite music. When the straps are hidden, you can use the backpack as a suitcase for flights. Worried about thieves? The hidden anti-theft pocket from the back keeps your small items safe. 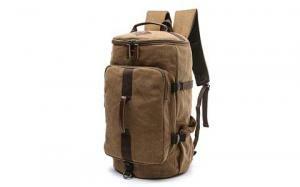 Available in over 20 colors, Hynes Eagle's best travel backpack adds to your versatility as well. If you travel by plane a lot, you can simply remove the straps and turn it into a duffel. It's made of polyester and PVC. In other words, it's sturdy and can keep your valuables safe. In terms of flexibility, it has a series of buckle straps on the sides, so you can adjust the height. The sternum strap is adjustable for a more comfortable walk too. Overall, the backpack measures 20.1x13.4x9.8 inches, so it's a bit bigger than other units in this segment. 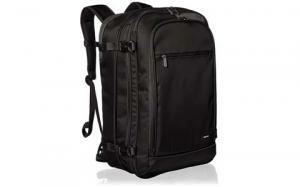 It has a main zipper compartment, as well as two front compartment sleeves – ideal for 15.6 inch laptops. There are more pockets on the sides, with the bottle pocket being easily accessible while the backpack is on your back. Are travel backpacks really practical? Travel backpacks have been designed to serve your needs while traveling. Now, through traveling, you can understand a lot of things: commuting, hiking, moving from one place to another every now and then or just visiting a friend. 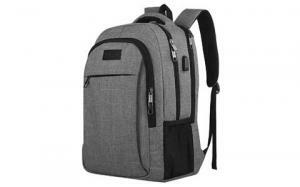 Regardless of the purpose of traveling, backpacks that were specifically designed for this purpose are versatile and practical, making packing and unpacking much easier. Another aspect that you should not disregard is the weight management, the comfort or discomfort that you experience while wearing it, as well as its durability. These backpack types are usually made to last, have a lot of pockets and compartments and a design that makes them more comfortable to wear even when carrying a lot of weight. The reason why they are more practical than the average backpack is that they have a large number of pockets and compartments that help you organize your stuff. Some models are expandable and they are usually made of materials that are waterproof, dustproof and odor proof. More than that, some come with internal frames that support heavy loads. There’s even more to it: there are travel backpack models that protect you from thieves, having sturdy closure, hidden pockets and more. How much weight can a travel backpack support? This is a question that hikers ask very often. The truth is that the weight a backpack can support depends a lot on the design, the quality of the materials and the size. Before saying that a backpack isn’t suitable for your needs, make sure that you set your expectations straight. If you need to carry very heavy loads, you should always think about buying hiking backpacks or suitcases. If you only need a regular sized backpack, then you should know that usually it can support up to 15 pounds of weight. Depending on what you are planning to take with you in your travels, the average backpack can support eve more, but you have to make sure that everything fits well inside. If your main concern is if you can carry your laptop, clothes and other personal belongings that will cover your needs for a few days, then a travel backpack is certainly tailored for your needs. If, on the other hand, your trip will be longer than a week or your will go exploring the mountains, you will need something larger. When can you use a travel backpack? Thanks to the fact that travel backpacks are truly versatile, you can use them in all kinds of situations. Most consumers choose compact backpacks to commute to work with, as they have a great design, they are roomy and have a great weight management system. Especially those who work in the IT industry love these products. If you are not a fan of going to work wearing a backpack, then you can use it when exploring nature, when going to visit someone, when hiking, trekking or when traveling by airplane if you want to take a cabin bag with you. As a short final conclusion, finding the best travel backpack is solely based on your necessities. Sure, most backpacks can do the trick if you need something basic for weekend trips or commutes to school. But if you're into traveling adventures, you better hunt a solid unit that can keep your things in good condition. You should be able to figure yourself what you need. Where do you plan to use the backpack? What do you normally have to carry? How often do you intend to use it? What is the weather like in your area? Answering these questions can lead you in the right direction. Not being able to test each product individually will raise a series of question marks. When you see a picture, chances are you imagine things differently. However, learning from others' personal experiences will work wonders. A few reviews will tell you what to expect and how reality is different from your imagination. Buying the best travel backpack takes a bit of time, but the result will clearly satisfy you in the long run. Fail to go through all these and you'll probably regret your choice.